Well, my job search is over. 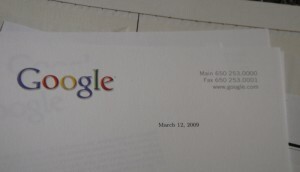 As of today, I've accepted an offer from Google for a summer internship. I'll be in New York City from June 1st through August 21th, working at Google's 9th Avenue office. I'm not sure where exactly I'll be living (I'm looking to apartments, student housing, etc., but haven't settled on anything yet), but I'll try to keep you, my loyal readers, up to date. Anyhow, whee! Now I can go back to worrying about work now, instead of three months from now. For the time being, though, it's back to spring break with me.